I consider these to be the most important ebook formats now in use outside of the more or less separate Kindle universe. All files are DRM-free. When the book was first released, I configured the Lulu catalog item so that it would sell the PDF print image as a download. This was a mistake, because fixed-page PDF files are not very good ebooks if you&apos;re using anything smaller than a laptop or a tablet, and the download PDF option implied that PDF was all that you could get. Big thanks go to John Ridley for putting me on to the Calibre ebook toolset, which converts very cleanly from a Microsoft Reader .LIT file to the Sony Reader .LRF file. Odd tools like that are popping up constantly in the ebook world, and it&apos;s hard to stay ahead of it all. If you mention Souls in Silicon somewhere, even if you only saw the print edition, please indicate that it&apos;s available in an ebook edition as well. Thanks! I&apos;m hard at work on my second collection, which I will (probably) call Cold Hands and Other Stories. Much depends on whether or not I decide to include my short novel Firejammer, which is a YA item and may be better off on its own or with something else like it. With Firejammer the collection would be a little long; without Firejammer, it would be a little short. (25,000 words makes a difference!) I&apos;ll keep you posted. We have lost another Duntemann, in a world where there have never been many: John Philip Duntemann of Des Plaines, Illinois died this past Monday night, of cancer. He was 83. John Phil (which is how he was known in our family) was a strong and gentle man, my father&apos;s first cousin, who raised seven children and saw them earn a collection of advanced degrees like I have never seen in a single household. (Most of the Duntemanns you see online who aren&apos;t me are his children.) John was in England during the Blitz, and tells the story of how he heard an odd noise at one point while working on a piece of construction machinery, put his wrench down, looked up, and saw the guldurndest little airplane fly thirty feet over his head, to go on another mile or so and explode. It was a Nazi V-1. He didn&apos;t know that he was experiencing history; he would say he that was just doing his job. (I&apos;d prefer not to live that kind of history!) Godspeed, John. Mission accomplished. Pat Thurman K7KR sent me a link to a nice set of reviews of Chicago restaurants. Also from K7KR comes word that Tom Kneitel has left us. Tom was a wickedly funny writer from the heyday of CB and build-it-yourself electronics, and I used to read his column in Electronics Illustrated before I looked at anything else. (In flipping through some old issues this morning, it sounds weirdly like a blog.) Oddly, his most famous book was a small press thing about how to listen in on other people&apos;s cordless phones, which was evidently quite a hobby in the 80s and 90s, when they were basically FM walkie-talkies. He was also the grandson of cartoonmeister Max Fleischer. This face-animation technology seems awesome on the face of it (as it were) but in reading the explanation, it sure starts to sound like his-res rotoscoping to me. Hey guys, do it without a model reading the lines for you, and I&apos;ll be much more impressed. I&apos;m having hosting service problems here—have had them for some time, actually—and will probably jump to another service in coming months. I&apos;m considering using Joomla to host Contra and my photo galleries, and create an online SF workshopping system. I&apos;m tired of editing Contra by hand, but I&apos;m unwilling to have its primary instance outside my control, as it would be if it lived entirely on LiveJournal or Blogger. Anybody out there have any thoughts on Joomla as a platform for this sort of thing? One reason I like Jim Strickland&apos;s fiction is that I like the way he thinks. He and I look at the future and draw a lot of the same conclusions. I understand his logic, and that helps me appreciate the stories he tells, even if I myself would not tell them in anything like the same way. Being able to toss ideas around with him in person helps a lot; we workshop together, and I&apos;ve learned quite a bit watching him hone his style. 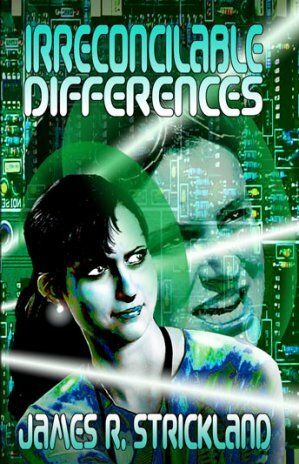 So we come to Irreconcilable Differences, which was released at the publisher&apos;s frontlist party at Denvention a few weeks ago. As with his first novel, Looking Glass, we have a police mission in a now+20 near future in which the world has boiled over but not burned. The US has split into several pieces along tribal lines, and various interests are trying to bring the world into a new equilibrium. Chief of these is Interpol Covert Services, which is paying particular attention to activities on the Internet. As a means of cracking a particularly difficult case, Interpol has gone deep bleeding edge and uploaded the mind and memories of one of their toughest agents into a 16-year-old hacker girl who got caught, and agreed to the mission as part of a plea bargain. The agent is Rachel Santana, who&apos;s lived a little too much; the girl is Micki Blake, who has barely lived at all. The two coexist in a single body, Micki in her own brain, Rae in a block of high-performance synthetic nerve tissue inserted surgically. They communicate internally through a sort of VR boundary zone called the gestalt, which is more than conversation but not quite telepathy. With Rae on board directing the show, Micki returns to her small-town hacker group, a little bleary but suspecting that she&apos;s not in Kansas anymore. Except that she is. Micki is a Kansas farm girl (from a farm that harvests the wind as much as meat and grain) and the action is out on (and under) the Kansas plains. Micki/Rae ride with the rest of their gang along dirt roads in a ramshackle Winnebago RV full of state-of-the-art networking gear stuffed in a closet, ducking in and out of the Net as needs require. The rest of the story is nonstop action taking place at several levels, with some diabolical twists and turns that I&apos;ll leave for you to discover. Where we may also not quite be anymore is cyberpunk, even though that&apos;s how Jim characterizes the novel. There&apos;s lots of exhaustively researched cyber here, but very little punk. The American culture of the plains has mutated in some ways, but it&apos;s not the oh-so-precious Gibsonian San Francisco noir that always makes me giggle a little when I read it. Kids still ride on school buses and go to dances—and now help one another keep the family wind-turbines turning. The rural character of the future is an intuition I had 20 years ago: Once the Net genuinely fuzzes out the idea of physical location, the real action will be where the food and the energy come from. Cities produce nothing but proximity—and once proximity ceases to be a core value, life on Earth will change radically, especially if even minor cold wars heat up a little. Maybe a better word would be “cyberbilly.” I think of it that way; the heartland has more head than the headland will ever have the heart to admit. One of the few downsides to the novel is that it&apos;s too short to give us as much flavor for this future world as I&apos;d prefer. Jim has rightfully emphasized the questions of what it&apos;s really like to be a copy of a human being—something most cyberpunkers and transhumanists take for granted and never think too deeply about. Rae&apos;s struggles with this issue of self are mirrored in Micki&apos;s struggles to appreciate the self that she has, and the two are inadvertent agents in one another&apos;s healing processes. The story is a personal one, intense and immediate. Another 50,000 words would have fleshed it out, but also slowed it down. It&apos;s a conundrum that every good writer has to confront eventually. I think Jim made the right choice here. He will have future novels in which to develop the world as a whole, and I&apos;m patient enough to wait for them. Jim gets extra points for appending a glossary to the end of the novel, summarizing the technological and cultural ideas he&apos;s presented through the story, along with quick brushups on networking terms. You may need it; this is one of the most unabashedly technical novels I&apos;ve seen in a long time, and for a hard SF guy like me, well, that&apos;s simply delicious. I lived in Scotts Valley, California for three years, and I never once heard of Axel Erlandson, an arborsculptor (that is, a person who coerces trees to grow in odd or artistic ways) who had a roadside attraction of sculpted trees in Scotts Valley from 1955 to about 1970. Not as weird as the Mystery Spot and clearly not weird enough for the Santa Cruz vicinity, the Tree Zoo was not a success, but some of those trees are mighty odd. There&apos;s a PDF document detailing name changes to Chicago streets here, and it explains who or what some of Chicago&apos;s streets were named after. The street where I grew up, Clarence Avenue, was named after a river in Australia. Kedvale, the street on which my grandparents lived, was an Anglicization of an Indian term for the print of a moccasin in damp ground. (Hence those shoes named “Keds.”) Thanks to Pete Albrecht (another old Chicago boy) for the link. From the Some People Have All The Fun Dept. : Walter Jon Williams got himself and several other SF writers a tour of the NORAD facility inside Cheyenne Mountain, during this recent Worldcon. How they pulled it off isn&apos;t clear; I was told by people who have reason to know that they&apos;re just not doing tours anymore. (And sheesh, I only live about 3/4 of a mile from the Big Iron Door!) Thanks to Jim Strickland for letting me know. Bill Higgins sent a link to an interview with Wayne Green in ComputerWorld. Ol&apos; Wayne is now 86 and still out there, supporting weird causes and making a ruckus–just not in the magazine business anymore. I&apos;m fond of the guy because he bought my very first published article in the fall of 1974, and quite a few others in subsequent years. His legend counfounds historians; I&apos;ve gotten many different opinions on just how much he had to do with Byte. I still have a very funny but weird little book called See Wayne Run by Gordon Williamson that suggests that he had little or nothing to do with Byte, but other people with reason to know claim otherwise. Here&apos;s some useful reminiscence/discussion; see especially the comment by Harry Helms W5HLH. Many things have conspired to slow me down since Worldcon, but I&apos;ve begun to catch up, and this morning I finally got Souls in Silicon uploaded to Lulu and ready for sale. 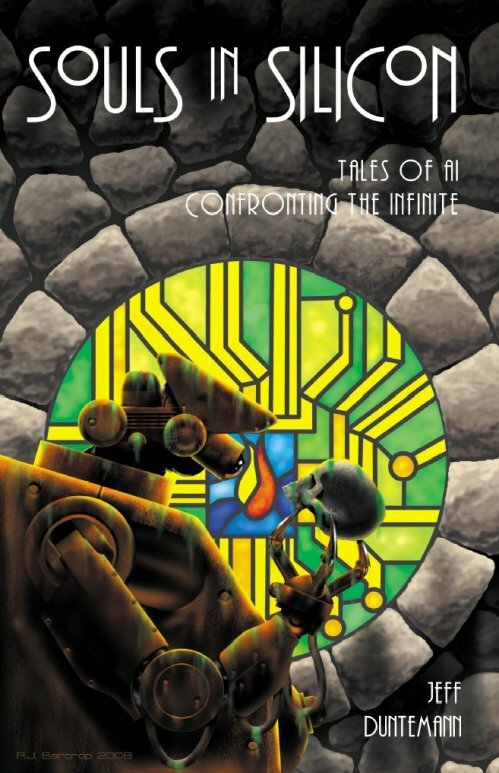 The book is a collection of all my published stories (plus a new one) about strong AI. Some may be familiar to you (like “Guardian,” which was published in Asimov&apos;s in 1980 and appeared on the final Hugo ballot in 1981) but some of it appeared a long time ago in markets that paid real money but were obscure or problematic in various ways. Jan Howard Finder&apos;s hardcover anthology Alien Encounters published “Marlowe” in 1982, but the only sales report I ever saw indicated that it had sold 125 copies. Ditto Larry Constantine&apos;s Infinite Loop, another hardcover anthology. It put “Bathtub Mary” into print in 1993, but there were shelving issues (bookstores thought it was a computer book because it was published by Miller Freeman) and the only time I ever saw it in stores was next to a pile of C++ tutorials. So it was time to get them all available again, in a single presentable volume that will never go out of print. The cover art is by Richard Bartrop. 188 pp. $11.95 print; $3.99 PDF download. No DRM. The book is currently available only from Lulu. I&apos;m working on getting it ISBN-ized and converted into all the major ebook formats, and with some luck into Amazon&apos;s Kindle bookstore. 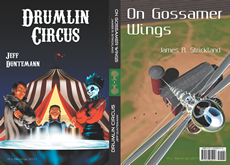 I&apos;m planning a second collection for the fall, containing all the rest of my published SF and a couple of new items. The title and and contents of that one depend on several decisions I haven&apos;t made yet, but I&apos;ll keep you posted. As always, reviews or simply blog mentions would be greatly appreciated. Wired ran a nice piece on how little we know about brain function—and therefore how silly it is to claim that we&apos;ll have “superhuman” computation by 2020. If we can&apos;t model it, we can&apos;t duplicate it, and the model has proven extremely slippery. Good-bye singularity, not that it ever made much sense even granting astonishing increases in computer power. Here are some nice comparison tables showing how the pricing models of the leading POD houses affect publisher take-home revenues at various sales levels. I now have a photo of John T. Frye on my Carl & Jerry page, in case anyone wondered what the man himself looked like. Many thanks to Michael Covington for processing the scan for me. Carol and I got up at 3:30 AM last night and found the skies crystal clear, so we hauled out onto the back deck in our fuzzy robes (along with a couple of doubtless-puzzled bichons) sat down in two of the patio chairs, and leaned back, facing generally east. The Perseids did not disappoint; in forty minutes we saw twenty or so, and most of them were quite bright. We didn&apos;t have access to the whole sky with the house behind us, so I&apos;m sure we missed quite a few. Still, the count is about in line with what we&apos;ve seen in past years, and for Carol and me (and the Perseids) there have been a lot of past years. In fact, I&apos;m pretty sure we watched them from her back yard two weeks after we met in 1969, though not at three in the morning. No matter. I see meteors almost any time I spend more than a minute or two scanning the skies, even from as light-befouled a place as the close-in Chicago suburbs. One reason Carol came to love as scruffy and odd a specimen as me was that I was willing to talk science with her. I pointed out the constellations to her, and dragged my junkbox telescope out into her driveway to show her the moons of Jupiter. Over the years, the Perseids have become something of a tradition for us. I saw a shooting star last night, you see. In just the time you&apos;d take to poke the coals. If, going out, I knew I&apos;d make such light. “Well, sure!” I said, taking the sheet back from her hands. A quick count reassured me that it had…13 lines. Damn. Ever since then, I&apos;ve been famous around the house as The Guy Who Writes 13-Line Sonnets. Clearly, rhyme was good for something—like helping numerically illiterate poets keep track of the number of lines they were producing. After that, I returned to my more freeform e. e. cummings period (which had been the first three weeks of May, 1972) until I found the wisdom to understand that I was a better astronomer than I was a poet. I&apos;ve stopped writing poems, but the Perseids—heh, like Carol and me, that&apos;s forever. I&apos;m a sucker for a Depression-era railroad oddity called the Galloping Goose, which is a stitched-together Frankenrailcar made of bus and truck parts and other odd bits. Pete Albrecht sent me a link to a nice history/photo site, revealing something I had not known: That there&apos;s a Goose still running and giving rides, down in southwestern Colorado. Won&apos;t happen this year, but next year fersure! I accidentally deleted a bunch of fonts that I was bringing back from Chicago, but a nice free undelete app named FreeUndelete saved my clumsy bacon. It&apos;s not a no-install app, but it&apos;s pretty lightweight, and works like a champ. Free for personal use. Recommended. Several people have mentioned Lexcycle&apos;s Stanza ebook reader app to me in recent days. I downloaded it earlier today and installed it downstairs on the XP lab machine (it&apos;s another app that claims not to support Win2K) and I will say, it has some promise. It does require the Java Runtime, and it certainly needs to do a little growing up, but I&apos;m glad to see any serious effort to build a universal reader app for ebooks. And while we&apos;re talking books, take a look at Zoomii, a Web front end for Amazon that shows books on shelves bookstore-style, though every one is face-out. (Now that&apos;s a switch!) You can zoom around and click on a book to get the details. The shelves come up zoomed back enough so that the covers are undiscernable smudges; make sure you click on the plus sign in the navigation cluster to bring the display in close enough to read them. I found this fascinating and fun (at least for the ten minutes I spent on it) though I don&apos;t know whether I&apos;d use it except for the serendipity value. However, given that Amazon sells books that will never see the inside of a bookstore, Zoomii may bring back the importance of cover design to small and very small press books. The programming tracks at Denvention 3 didn&apos;t get me terribly fired up to see them, and that was evidently a common reaction. Instead, I spent a lot of time with friends camped out on couches talking tech. Intense discussion went on about ebook readers and what they ought to be, along with much flashing of Kindles and Sonys and iPhones—which, I might suggest, would make reasonable reflow readers if a Certain Somebody of Inconsistent Insight wasn&apos;t so convinced that nobody reads anymore. (And if Apple didn&apos;t reserve the right to reach down to your iPhone and nuke any application it doesn&apos;t like…) So it may be time to outline what several years of thinking (and a certain amount of messing with various reader thingies that I have owned, borrowed, or simply beaten on) have converged to, in my own vision of an Ideal Ebook Reader. The shouting war between those who want to read fixed pages and those who want to read reflowable text is pointless, and after awhile, silly. There is more than one possible view of a document, and as with suits and dresses, some documents look better in certain views than in others. A novel or nonfiction volume lacking illustrations can be read reflowably on a small screen. Anything with useful page structure or significant illustrations requires a genuine page view. Page views require large displays. There&apos;s no getting around that. On the other hand, the conventional wisdom that you must have either a full-page view or a pocket-sized device is also dead wrong. Envision this: A rectangular block roughly the size and shape of an iPhone. It&apos;s really a storage module, with an SSD of a decent size. (I&apos;d suggest at least 32 GB for starters.) The storage module has some minimal intelligence, and a battery. On one end, there&apos;s a high-bandwidth serial connector. USB 2 isn&apos;t quite broad enough. ESATA would work, or whatever comes after USB 2. Now, note well that the storage module is not only a storage module. It has an display and touch controls, and a renderer for reflowable ebook text, as well as a viewer for images and videos. It may also be a cell phone; certainly, there&apos;s room for the jelly beans in something that size. Now envision a second, larger device, which is basically a tablet, or a convertible clamshell. It isn&apos;t necessarily a competitor to a full-featured laptop or Tablet PC, but something more resembling a 10″ or 11″ netbook, with enough processor muscle to handle Web browsing, email, and light text/spreadsheet manipulation. It has a slot for a removable drive…and the storage module I described above plugs into the slot. The tablet uses the smaller module for its data storage, but the data storage device itself can operate independently, as a pocket ebook reader or even a cell phone. No sync problems: There&apos;s only one SSD for both devices. But when you don&apos;t need the tablet reader, you pop out the pocket reader and stick in your pocket. If you have an idle moment, thumb it on and read another chapter from The Molten Flesh. Or call ahead to reserve a table at Chez Geeque. What we basically have here is a GSM-equipped pocket reader that “wears” a larger tablet reader for the sake of its display and battery, and possibly its keyboard. The two devices (tablet and pocket reader) don&apos;t necessarily have to be made by the same firm. The two physical form factors and interface mechanisms should ideally be an independent hardware/software standard, so that people could choose one device or another from several vendors, mixing and matching tablets and pocket readers to fit their own preferences. Not everybody may want a pocket reader, so a “dumb” storage block without a display would be possible, and cheaper. Putting GSM on the pocket reader would allow the pocket reader to be a cellphone, and the docked assembly to work like a Kindle. I don&apos;t know how likely this is, and I know it&apos;s not going to happen next week. I just need to make it clear that this is what I want, and what I think might serve the needs of the greatest number of ebook people in the greatest number of ways. I do know that getting into the either-or mindset is a trap, for ebook readers or anything else. We are engineers. We solve problems. And sometimes one solution lies inside another. At Denvention 3, at the Denver Convention Center. I used to hit just about every worldcon or NASFIC, but my life got a lot more complicated in the mid-80s, and the energy I used to put into writing SF began to go into computer books. Then when Keith and I kicked off our own publishing company, yikes! So I haven&apos;t been to a Worldcon in 8 years, and haven&apos;t been to a con at all since the 2005 Windycon when ISFiC Press launched The Cunning Blood. I got here Thursday about suppertime and checked into the Westin Tabor Center, which has great beds and showers but lousy soundproofing, and perhaps the noisiest plumbing of any major hotel I&apos;ve ever visited. This morning I awoke to a sequence of three showers, one to either side of me and then another above me. I know, I know, I&apos;m an Insomniac of Unusual Sensitivity (IUS) and waking me up doesn&apos;t take much. The toilet tank refilling made a sound that should be sampled for a film involving spacecraft of unusual propulsion systems (SUPS) which is odd, considering how gutless the low-flow flush process itself proved to be. But the first item on the agenda was the Flying Pen Press premiere party over at the Tattered Cover Bookstore, at which Jim Strickland would be reading briefly from his second novel, Irreconcilable Differerences. The book is terrific and I&apos;ll post a detailed review here shortly; I want to read it again now that I have it in paper. But it may establish a brand-new subsubgenre that I might as well call “cyberbilly,” which is to say, cyberpunk in the small-town American heartland. Jim reads fiction well for an audience, and while most of the other books presented left me cold, I was left giggling by a short snippet read from David Boop&apos;s new book, She Murdered Me wth Science, which, well, defies description. David has done time as a stand-up comic and it shows, and the event as a whole reminded me that I&apos;ve read my own work in front of an audience precisely once, and need to practice a little. Yesterday morning I finally got down to the convention proper, and started running into people almost immediately; first Eric Bowersox, then Alex and Phyllis Eisenstein, then Bonnie Jones, Kelley Higgins, and (later) Bill Higgins. I had lunch with Mike and Alice Bentley, and eventually collided with Jim Strickland and his wife Marcia Bednarcyk. We camped out on one of the nice sofas set near the autographing tables and ended up spending the rest of the afternoon there, hashing out the issues of how the SF publishing business is changing, and how writers of insufficient reputation (RIR) can take advantage of the changes we&apos;re seeing. “Write more!” was Eric&apos;s completely incontestable answer (directed primarily at me), but tonnage, while important, is not sufficient. The issue remains open, but I got some great insights from both Marcia and Alice Bentley, who works part-time for Studio Foglio and pays attention to other small and very small press operations in this industry. There may not in fact be a general solution to the problem, but being more visible among the people who read your kind of material is something that kept coming up. This (obviously) leaves less time for actually writing it, especially for guys like me with Unusual Sleep Requirements (USR) but as with almost any system of many equations, there&apos;s a sweet spot on the curve somewhere. The main challenge is just finding it. I&apos;m about to go back over there and see what else may be going on. I have a couple of sessions marked with stickies in the nicely-implemented pocket program, but I will be heading home again later this afternoon. A little con goes a long way with me, but as Worldcons go, I have so far enjoyed this one a great deal.